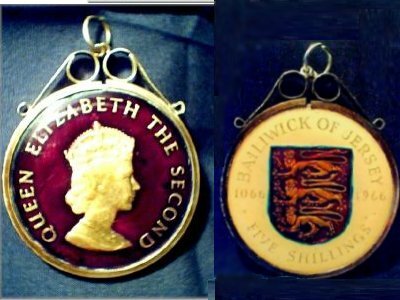 Some coins have been modified and adapted for jewelry purposes. Some for walking canes, some for broaches, and even some for cuff-links. Why not give your sweetheart an enameled broach for that special occasion? I'm sure she would appreciate it. 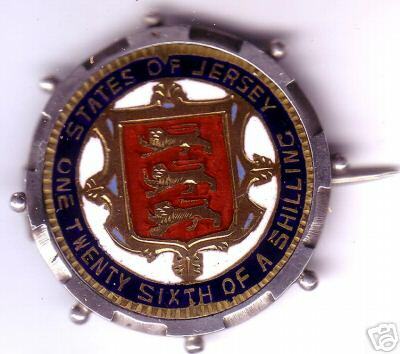 Pridmore, in his book, The Coins of The British Commonwealth of Nations, Part 1: European Territories, recorded various uniface pieces, cast in imitation of the Jersey 1/12th of a shilling. 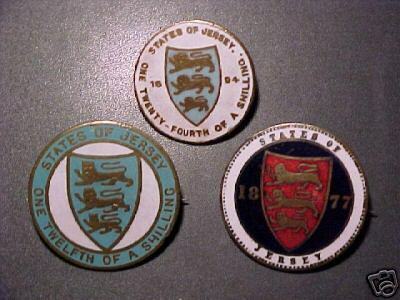 They generally feature the Arms of Jersey within in a Heater-shaped shield, with the legend STATES OF JERSEY above, and ONE TWELFTH OF A SHILLING below. One variety has the legend ONE TENTH OF A SHILLING. 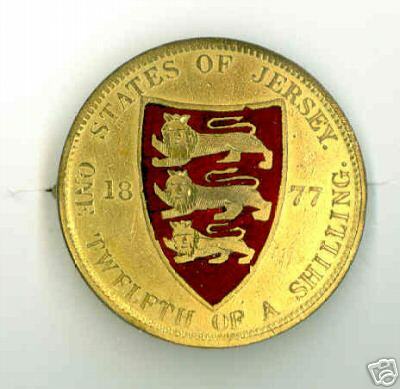 Several other varieties have the legend ONE 48TH OF A SHILLING. A similar piece to this is flanked by flowers. It is brass and measures 31.7 millimeters. I believe all of these pieces were used for decoration and were often enameled. 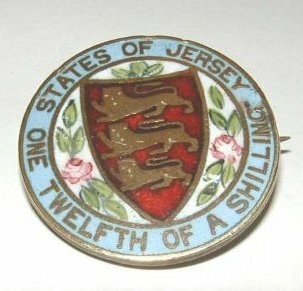 Typically, they adorned the handles of the Jersey cabbage walking sticks, very popular with tourists at the time. 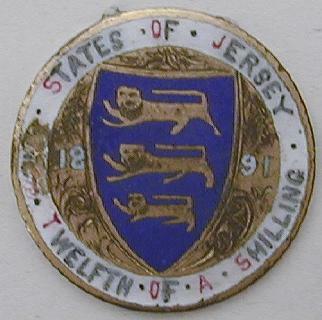 A Mr. Henry Gee of Beresfor Street, St. Helier, Jersey, was a leading manufacturer of these sticks from about 1870 to 1928. This piece is probably dated 1890 and is a new variety to me. The variety of cabbage used to make Jersey Cabbage Walking Sticks is Brassica oleracae longata and it is unusual in its growth habit in that the cabbage is produced on a long straight stalk that can reach several feet in height. The dried out sturdy stalks have been put to several uses in the past, including in the construction of roof rafters, but probably the most unusual is as a walking cane. 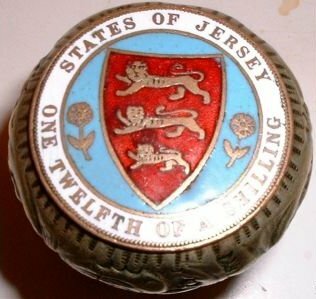 Traditionally the cane would be sanded and varnished to protect the wood, and finished off with a Jersey "coin" set into a mount at the top, and a brass ferrule finished off with a steel tip at the base. The article Plant Portraits, Walking Sticks as Seed Savers--The Case of the Jersey Kale by Hew D.V. 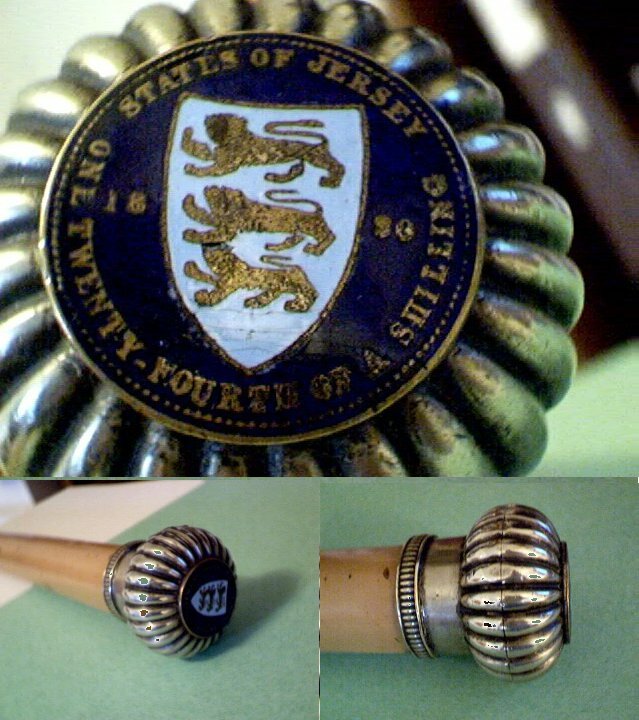 Prendergast describes the Jersey walking stick in details. This particular example does not have a date. This example has a date of 1891, when no circulation issue was made. 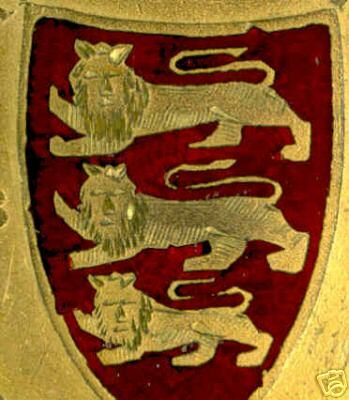 This nice broach has witty lions. 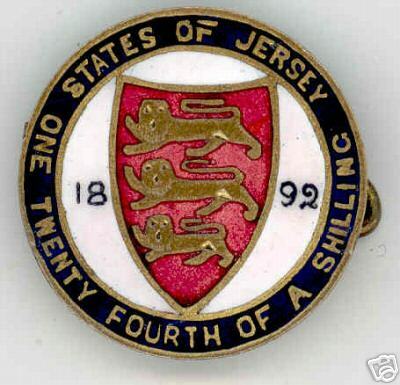 A very nice broach with "oh my" lions. Another example without a date. 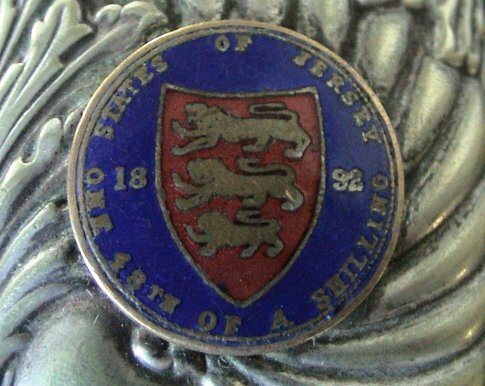 This is a scarce 'high grade' 1877 1/48th of a shilling from Jersey that has been nicely enameled in four colors blue, red, white and gold. 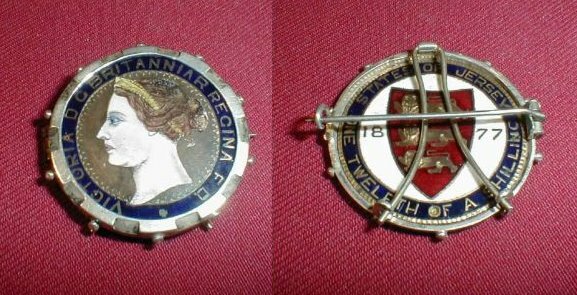 It has a broach pin on the reverse for wearing. 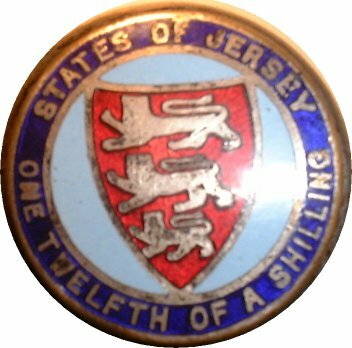 This is a scarce 'high grade' 1877 1/12th of a shilling from Jersey that has been nicely enameled on both sides. This is an unusual coin to have been decorated in this way. A very nice broach made from an 1871 half-penny. 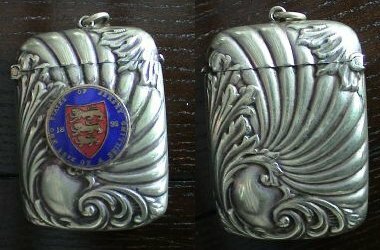 A vesta case with an 1892 1/48th "coin". 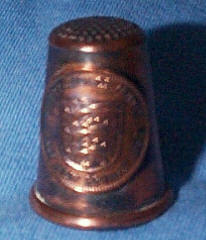 This is a copper thimble made with a Jersey 1980 half penny. 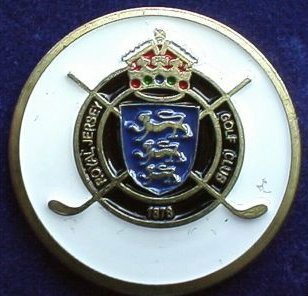 Golf ball marker for 100th anniversary of the Royal Jersey Golf Club 1878 - 1978. Even modern coins can be used in jewelry. 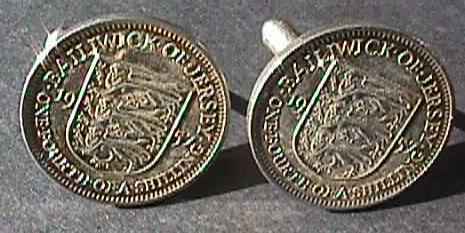 A nice pair of cufflinks for the well dressed gentleman.